Complete profile of Tade Ogidan, the Award Winning Nollywood Director And CEO Of OGD Pictures Ltd..
Producer/ Director; several Television drama including THE VILLAGE HEADMASTER Series and some other Award winning projects in the 80s. HOSTAGES Part 1 & 2: Action drama genre. PRODUCTION: HOSTAGES, shot in the early nineties, featured extensive police action and a great story line full of chair-edge suspense. It’s a story with great twists and turns. It stars Richard Mofe Damijo, Yomi Obileye, Ebele Okaro, Bimbo Manuel, Lanre Balogun, Antar Laniyan, Tunji Sotimirin, Tope Idowu, Ofuafo Otomewo, Danjuma Mohammed, Layi Ashadele, Tunji Olugbodi and Zainab Buky Ajayi. It won several awards at the Nigerian movies awards, including BEST FILM, BEST ACTOR, BEST ACTRESS, BEST SUPPORTING ACTOR & ACTRESS, BEST DIRECTOR, BEST SCREENPLAY, etc. The film has featured in a number of international film festivals. The TV serial version has also been broadcast on TV in and outside Nigeria. HOSTAGES was written, produced and directed by Tade Ogidan. 1990-1991. Dialogue: English. It was released in 1996. OWO-BLOW Parts 1, 2 &3: Action drama genre. PRODUCTION: OWO-BLOW has been rated as one of the greatest Nigerian movies till date. It is dialogued in Yoruba and has recorded on one the greatest sales in the African film market. The movie won several awards at the Nigerian film awards, including BEST YORUBA FILM, BEST ACTOR, BEST ACTRESS, BEST SUPPORTING ACTOR, BEST SUPPORTING ACTRESS, BEST EDITING, BEST CROSS-OVER ACTOR, BEST NEW ACTOR, etc. Even the most unexpected actors and actresses swept awards for fantastic performances in the film. Screenplay by Tade Ogidan, Producer: Niyi Wuraola, Director: Tade Ogidan. Dialogue: Yoruba. OUT OF BOUNDS: Drama genre. PRODUCTION: OUT OF BOUNDS got several nominations and won three awards at the Nigerian movies awards. It would have packed more, but it was in the same award ceremony with HOSTAGES, which won most of the key awards that year. The film has featured in a number of film festivals abroad. Screenplay: Tade Ogidan, Richard Mofe Damijo, Director: Tade Ogidan. Dialogue: English. RAGING STORM Parts 1&2: Drama genre. PRODUCTION: RAGING STORM got great press reviews. It performed greatly in the market in terms of sales. It is rated as one of the most complex stories ever featured in Nigerian films. Featured stars: Francis Onwochei, Ronnie Dikko, Zainab Buky Ajayi, Bimbo Manuel, Keppy Ekpeyong Bassey Inyang, and Sunday Afolabi. It was shot in 1997. There were no movie awards in the year that it would have qualified to compete for such. It would have swept quite a number of the categories. It was screenplayed and directed by Tade Ogidan. 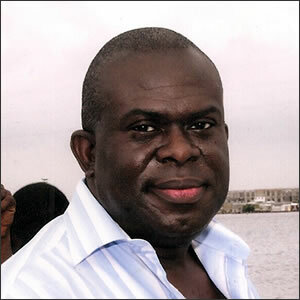 Producer: Francis Onwochei. Dialogue: English. DIAMOND RING Parts 1 & 2: Drama genre. PRODUCTION: A lovely story told the African way, DIAMOND RING was shot across Nigeria and London. It features Nigerian and British stars. It stars Richard Mofe-Damijo, Susan Cave, Sola Shobowale, Teju Babyface, Zainab Buki Ajayi, etc. DIAMOND RING has again been rated as one of the greatest Nigerian films by the media. It won 6 major awards, including BEST FILM OF THE YEAR, BEST SCREENPLAY, BEST DIRECTOR, BEST SPECIAL EFFECTS, BEST NEW ACTOR, BEST EDITING. The film was shot in 1998. It was written, screenplayed, produced and directed by Tade Ogidan. Dialogue: English. SEVEN TO TWELVE. : Action drama genre. PRODUCTION: 7 TO 12 is a film which deals with the issues of miscarriage of justice and the lapses in the imperfect Nigerian system. We had total co-operation of Major-General Buba Marwa, Military Governor of Lagos then. The film featured the use of police helicopters, as we also got the support of the elite police arm, “Operation Sweep”, who also featured in the film. The film stars Emeka Ike, Olu Jacob, Fred Amata among others. The film was shot in 1997. Producer: Emeka Ike. Director: Tade Ogidan. Dialogue: English. PRODUCTION: SAVING ALERO is a powerful film which tackles the problems African women go through when their husbands die. The rites of widowhood, in-law problems, complex African inheritance issues, are dealt with in this film which has gone for a number of international film festivals and screenings. PLAYING GAMES Parts 1, 2, 3:. Action Drama genre. PRODUCTION: PLAYING GAMES is another hit movie with a great storyline. It packs a lot of fun, humour and suspense which characterises most OGD PICTURES projects. It’s a great favourite with the audience. It stars Uche Osotule, Basorge Tariah, Sola Fosudo, and Francis Onwochei. It was shot on in 2002. It was written, produced and directed by Tade Ogidan. Dialogue: English. PRODUCTION: It’s a huge project, starring Ramsey Nouah, Stella Damasus-Aboderin, Lanre Balogun, Shola Shobowale, Bimbo Akintola and Nobert Young. A first class movie project. The film was shot in Nigeria, London and other parts of Europe. The film is a huge success in the open video film market at home and abroad. It features Great flawless special effects. The movie has featured in local and International film festivals. The Cultural Attaché of the French Embassy in Nigeria, was at the premiere of the film, and loved it so much that his department secured a French government sponsorship for a translation into French and the French sub-titling of the film. It has won vital awards including BEST ACTOR, BEST SPECIAL EFFECTS, BEST DIRECTOR, BEST FILM. The film was shot in 2003/2004. Dialogue: English. MADAM DEAREST Part 1 & 2: Drama genre. PRODUCTION: Starring Akin Lewis, Ope Ayeola, Sola Sobowale, Deji Adenuga, Zainab Buky Ajayi and Yemi Solade, MADAM DEAREST is one of our greatest film projects. It was shot on locations in Nigeria, Republic of Benin and Ghana. The suspense in this is awesome. So is the performance all round. The film has won a number of awards at movie awards. It packs loads of nominations as well. A collection of Nigerian film and Television stars performed the music soundtrack for the movie. The collection of this music has been released as a music album and videos. It is one of the greatest selling music album and videos presently in the market. MADAM DEAREST was written, produced and directed by Tade Ogidan. Dialogue: Yoruba, Egun and Twi. This movie is the rave of the film markets at home and abroad. It was released in 2006 and 2007. It would be in for awards this year. FAMILY ON FIRE: Action drama genre. PRODUCTION: Another powerful film from the OGD PICTURES bay. It was shot mostly in London and Nigeria. It features top Nigerian stars, like Saheed Balogun, Shola Shobowale, Sola Fosudo, Segun Arinze, Simi Opeoluwa, Bukky Amos, Yinka Olusanya and Lanre Hassan. The film also features a number of British actors. It was premiered in London and Lagos 2012. Mrs. Fashola rates her experience at the event as one of her best ever. It has massive public appeal. FAMILY ON FIRE was written and produced by Tade Ogidan. Directors: Tade Ogidan, Simi Opeoluwa Dialogue: Yoruba, English and Spanish. ALL OUR FILMS HAVE BEEN SCREENED AT THE MAJOR CINEMA HOUSES OR COMMUNITY VIEWING OR EVENT CENTRES ACROSS NIGERIA. BEHIND THE SIEGE : Drama serial. 80 episodes of a very powerful and highly entertaining TV drama serial. The serial enlightens the viewing public on the issues of HIV/AIDS/STIs. Featured Stars: Jide Alabi, Tina Mba, Lanre Balogun, Yemi Remi, Yinka Akanbi, Joseph Ofili, Uche Osotule. Directors: Tade Ogidan, Akin Fadahunsi, Yinka Akanbi. This is Nigeria’s first business reality show on television. It has been rated as one of the most successful and intelligent reality shows on television. OGD PICTURES LTD. provided all the technical production crew for the project. Project Producer: Ofem Ekapong Ofem. Director: Tade Ogidan The show is in English. This is an Entrepreneurial reality TV show. It’s become a hit. Sponsored by MTN and some other support sponsors, it is expected to be produced, one season a year for the next five years for a start. Director: Tade Ogidan. This is currently running on television and certainly making waves. It launders the image of the Nigeria Police Force in such a way that it finds audience appeal. It has all sorts of segments that sustain viewer interest; and this includes the reconstruction of crime cases as supplied by the Nigeria Police. The programme has opened a better door of understanding and co-operation between the Nigeria police and the citizens. The series is filmed all over the police command in Nigeria. We also worked with INTERPOL on a special project on Human Trafficking and Prostitution, where we filmed episodes of the series in Italy, France, and Germany. Done in conjunction with our sister company, Bi Communications Ltd, the OGD Pictures team created the format, look, and direct the weekly series. A magazine programme for television, the series features interviews with successful Nigerians who live in foreign countries. It basically launders the image of Nigeria and Nigerians in Diaspora. Something to showcase positive contributions of Nigerians all over the world. This series has been shot in the U.S.A, Canada, U.K and a number of the Schengen countries of Europe. Some of the persons featured on this series have been invited by government to Nigeria to serve the nation and the states at various levels of their expertise for the benefit and advancement of the nation. Some have become Ministers of the Federal Republic of Nigeria; some are special advisers to government in various capacities. Concept: Tade Ogidan, Producers: Tade Ogidan, Bimbo Manuel, Ronnie Dikko, Directors: Tade Ogidan, Bimbo Manuel, Jonathan Gbemuotor. The series is in English. OGD ALLSTARS. A great gathering of Nigerian Movie Stars doing the unusual—Singing. It is a family favourite and its popular among Africans all over the world. Also, Music to promote the industrialization of Nigeria featuring Film and Television stars for the Federal Ministry of Trade and Industry. Tade Ogidan has handled and packaged or has been involved in some of the most sophisticated LIVE EVENTS held in and even outside Nigeria. Such clients range from Class A companies of the corporate sector to State governments and Ministries of the Federal Government.